AS A result of the Atlantic ocean pounding the beautiful island of Victoria in Lagos with eerie regularity, the coastline of the island has receded at the rate of five metres a year. Most residents, who belong to the upper-income strata, are planning to move out of the island to avoid staying for days in water-logged homes every time the ocean surges forward. Says a harassed Raphael Olayide, a resident, "Victoria island with its water-front is about the most comfortable place to live in Nigeria, but my safety and that of my family makes it imperative for me to leave. I am especially scared by the prediction that the island may be submerged by the Atlantic by AD 2006." 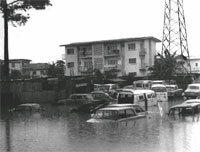 According to experts, the rapid erosion of the island and most of the Lagos coastline, was sparked off when the colonial British government constructed two breakwaters (a structure which provides protection against the force of sea waves, especially a mole or groyne) known as the east and west moles. These were built between 1908 and 1912, to protect the Lagos harbour from intense wave action and to prevent the sand drifting under the ocean surge from entering the deeply dredged bar-hour. However, the moles "altered the balance between the rate of deposition of oceanic sediments and the rate of erosion of the Lagos coast", states Sen Ogunseitan, an environmentalist. Since 1956, many erosion control measures have been taken to curb the ocean surge. Beach nourishment has, However, been the most widely adopted measure for keeping the ferocious waters of the Atlantic Ocean at bay. So Far, some 16 million cubic metres of sand has been pumped into Bar beach, one of the most popular and widely used beaches in the island. But these measures have not had the required effect and the coastline continues to erode. Larry Awosik, an oceanographer and the head of a four-member team of the Nigerian Institute for Oceanography and Marine Research, which has been monitoring the ocean surge said, "The sand nourishment was inadequate and relatively ineffective in its capability at containing astronomically high waters and waves associated with storm surges. The nourished beach is presently too low and should be raised about one to 1.5 metre above the present level to abate episodic (sporadic) events like the swells and surges which normally occur between the months of April and August annually." But because of the huge financial outlay involved, the government has been unable to take any measure beyond sand nourishment. Benjamin Akpati of the Nigerian Institute for Oceanography and Marine Research believes that available measures can only minimise the impact of the ocean surge and that finding a permanent solution to the problem is a difficult proposition. "When you come to the coastline, the word permanent has no meaning. The sea level is rising and it is a global phenomenon. With time, this place (Victoria island) will be under the ocean," warns Akpati.